So which phone do you get when you part ways with your Google Pixel 2 XL? If you are after a great camera, chances are you are going to pick either the iPhone X or the Galaxy S9+. Well, this is exactly what happened to two of our editors. And what better way of settling the argument of which phone has the best camera than pitting them together in a camera shoot-out. It won't be an easy call, this one - these two phones are quite equally matched so deciding which one has the best camera, is going to call for lots of pixel peeping. And that is quite alright since we're the pixel peeping type of crowd. But let's have a look at the camera hardware they are offering. Both come with dual cameras on their backs, 4x12MP in total. They're also in the same regular+telephoto configuration - no ultra wides or monochromes between these two. All four cameras feature stabilized optics too. Samsung's caught up with Apple this year and offers 4K video recording at 60fps and also gives you the option of using the storage-efficient H.265 codec. 1080p/240fps slo-mo was missing from the S8's spec sheet, but the S9+ levels the field with the iPhone here as well. In fact, no - the S9+ one-ups the iPhone X in slo-mo. Naturally, it's called 'Super' slo-mo and records at 960fps in 720p resolution, with auto triggering and easy GIF-making afterwards. On the flip side, neither of these has brought any tangible improvements to the selfie game. So that should probably mean that the Galaxy is ahead of the iPhone? Probably, but a refresh on this one can't hurt. Numbers look better in a table, so here's one with the iPhone X and the Galaxy S9+'s camera specs. A camera comparison also looks a lot better with some photos in it, but we're not ready for that just. First up, we'll be starting off on the next page with a more detailed look at the hardware and software these two have. You will find the camera samples just after that. Guys I need some help here. I got an old Iphone SE, I love it but I'm tired of that tiny screen. 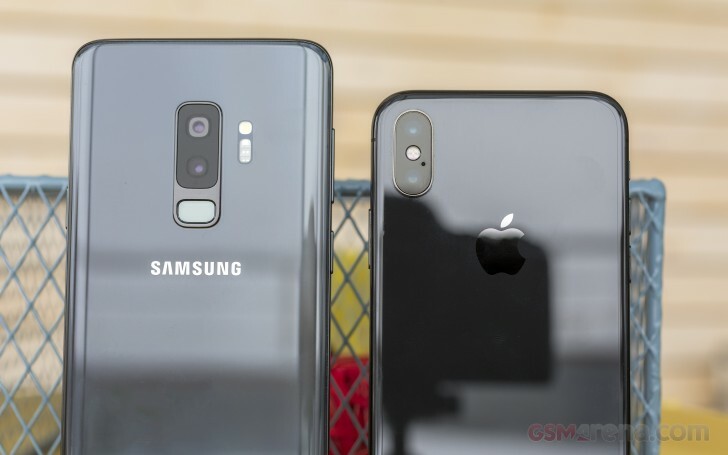 What shall I go for Samsung S9+ or IphoneXR? ?